Sony took to the stage today during GDC 2016 in SF to show off the consumer-ready version of its PlayStation VR headset. A good deal was already known about the company’s first foray into console virtual reality, except for a couple of key ones: price and availability. 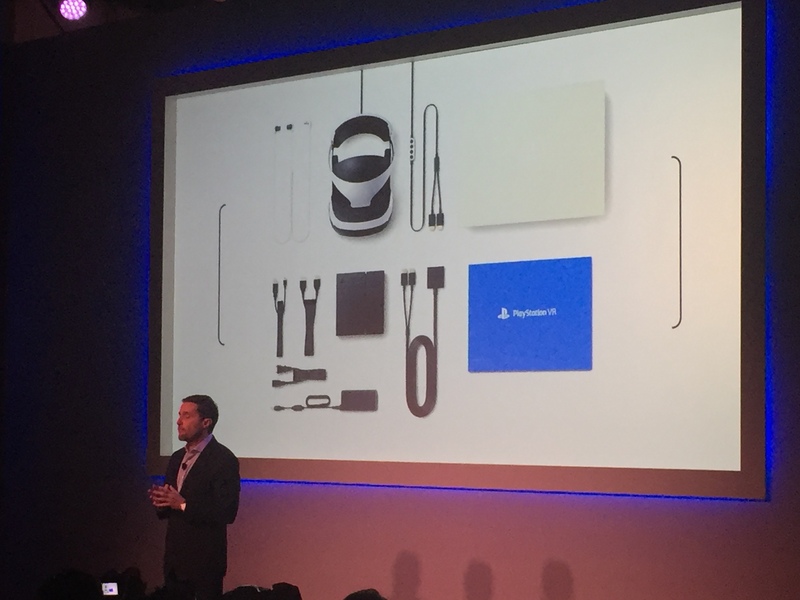 Well, we now know that the PSVR will be arriving in October 2016 for $399. This places the barrier of entry for PSVR dramatically lower for gamers looking to take a whack at virtual reality. With the Oculus Rift and HTC Vive priced at $599 and $799, respectively, while also requiring pretty hefty PC builds, PSVR has a real shot at being the headset to beat in terms of popularity. The $399 price tag notably doesn’t look like it includes the PlayStation Camera, which will be required for gameplay. The camera is going for around $45 on Amazon at the moment so it’s not a major cost though it’s definitely fair to assume that while some users already have the device it will be an additional cost for most PlayStation owners. Also not included are the glowing orb Move controllers, though PSVR users will definitely be able to use the motion-tracked DualShock controller that’s included with the system. We already knew quite a bit about the system, but here’s a quick rundown on the specs that matter. We’ll have full hands-on impression tomorrow after we’ve had a bit of time to play around with the final consumer version of the headset. There’s an inherently isolating quality to putting on a virtual reality headset (at least in the user’s immediate vicinity). An area where Sony holds a particular advantage over PC gaming is in regards to command of the living room. To keep VR gamers and console gamers engaged, PlayStation will be offering local multiplayer thanks to what they call a “Social Screen.” It will allow the PS4 to power both the TV and PSVR displays so someone with a PSVR headset can still sit on the couch and play with their buddies. If you’re a dedicated PlayStation gamer, you may already have everything you need to welcome the PSVR into your home setup including the PlayStation Camera, which will act as an eye seeking out the pair of Move controllers (or a DualShock 4) and the LED-emblazoned PSVR headset. Field-of-view (FoV) is one of the most apparent metrics in virtual reality headsets for achieving immersion and presence. The higher the FoV, the less it looks like you’re viewing content through a pair of goggles. Sony has said that the FoV of the PSVR is 100 degrees. The FoV for the consumer versions of Oculus’s Rift and HTC’s Vive have yet to be publicly disclosed but rumor is they both are somewhere in the 100 to 110-degree region. For comparison Gear VR’s field-of-view is 96 degrees. FoV surely isn’t everything. Oculus and HTC could build 200-degree FoV headsets if they wanted to. But right now, the key to building a top-of-the-line VR experience that won’t leave users reaching for barf bags is also keeping frame rates above 60fps. Having both of those (FoV and high fps) right now will probably require users to drop a few thousand bucks on a high-end graphics card, something that won’t do any favors to an industry looking to drive user adoption. PlayStation has the advantage of knowing the system limitations of every one of its users, and is, in turn, able to build a headset that maximizes the power of the PS4 system. The PSVR will operate at a constant 120hz refresh rate, a system level standard that is quite a bit higher than the 90hz offered by the Rift and Vive. This refresh rate is powering a 5.7″ OLED screen operating at 1920×1080. Screen Door Effect (SDE) is a fairly common term in VR that refers to the unsightly visible black lines between pixels that make it appear as though you’re viewing content through a screen. Sony claims that their subpixel screen design significantly lessens visible SDE by having individual red, blue and green subpixels make up each onscreen pixel. There are currently over 36 million PS4s out in the wild that are ready for VR. In addition to the expensive upfront costs for the headsets and controllers, gaming on the Vive or Rift requires a ~$1,000 PC build just to get fired up. While the PSVR may not initially offer quite as rich an experience as the other VR headsets because of the system constraints of the PS4, it’s accessibility in terms of price and available ecosystem give it some clear advantages that may land it a greater slice of the market when the “VR Wars” turn less friendly.